Sukh Ram is a former union communication minister in Indian National Congress Government. He was accused of causing a loss of Rs 1.6 crore to the exchequer by favouring a Hyderabad- based private firm in the purchase of telecom equipment. He, along with two others, was convicted in 2002. In 1995 when the reported manipulation of bids by Sukh Ram to facilitate private firms at the cost of millions of rupees to the government blew into the open, it came to be termed as the "mother of all scandals". The scam came out in the open when the department of telecommunications (DoT) was accused of favouring a Hyderabad-based private firm that had provided sub-standard equipment, resulting in a loss of Rs 16.8 million to the government. A raid by the Central Bureau of Investigation (CBI) that revealed Rs. 36.6 million rupees stashed in Sukh Ram's official residence shocked the nation and deeply embarrassed then prime minister P.V. Narasimha Rao's government. 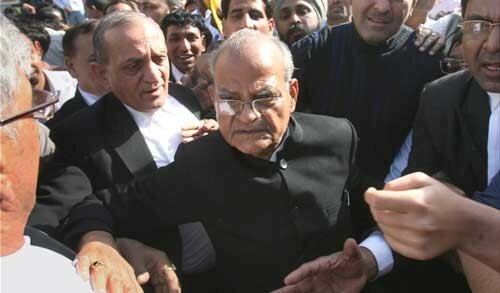 As the government reeled under the impact of the disclosures, Prime Minister Atal Bihari Vajpayee's Bharatiya Janata Party (BJP) - which was then in the opposition but has an alliance now with such Ram's Himachal Vikas Congress in Himachal Pradesh - paralysed Parliament to demand action against Sukh Ram and others involved in the scam. The CBI conducted intensive search operations at Sukh Ram's New Delhi residence and a country villa in his home state of Himachal Pradesh even as the former minister was in Britain, ostensibly for medical treatment. The raid was a result of police investigations into a DoT contract for multiple access rural radio systems awarded to Advanced Radio Masts (ARM), a small telecom equipment manufacturer. A day after the raid on Sukh Ram's house, Runu Ghosh, a senior official in the DoT, was also raided and huge amounts of cash and jewellery were recovered from her house. She was also arrested. Sukh Ram was dramatically arrested at New Delhi's Indira Gandhi International Airport close to midnight in September 1996, on his arrival from Britain, where he had taken refuge in a riverside town. Two more raids revealed more money and jewellery and Ram became a symbol of the deep-rooted corruption in Indian politics of which there had hitherto been no proof. Sukh Ram was also found to have favoured a joint venture, HFCL Bezeq Telecom, which had emerged the highest bidder in the race for privatization of telecom services. HFCL had bid Rs 500 billion more than its closest competitor. The consortium, led by HFCL, a company based in Himachal Pradesh, won the bids for five areas in the country but left serious doubts as to whether it could raise the money to complete the job. To help the company, Sukh Ram changed the terms of the bids after they had been accepted, it was alleged. Sukh Ram was expelled from the Congress party but this did not deter him from contesting elections to the Lok Sabha in 1996 from jail. He won. In March 1997, the CBI had filed a charge sheet accusing Sukh Ram and Runu Ghosh of abusing their official position as public servants.